Recent years have witnessed a significant growth of interest in the consequences of political violence and displacement for the young. However, when speaking of “children” commentators have often taken the situation of those in early and middle childhood as representative of all young people under eighteen years of age. As a consequence, the specific situation of adolescents negotiating the processes of transition towards social adulthood amidst conditions of violence and displacement is commonly overlooked. Years of Conflict provides a much-needed corrective. Drawing upon perspectives from anthropology, psychology, and media studies as well as the insights of those involved in programmatic interventions, it describes and analyses the experiences of older children facing the challenges of daily life in settings of conflict, post-conflict and refuge. Several authors also reflect upon methodological issues in pursuing research with young people in such settings. The accounts span the globe, taking in Liberia, Afghanistan, South Africa, Peru, Jordan, UK/Western Europe, Eastern Africa, Iran, USA, and Colombia. 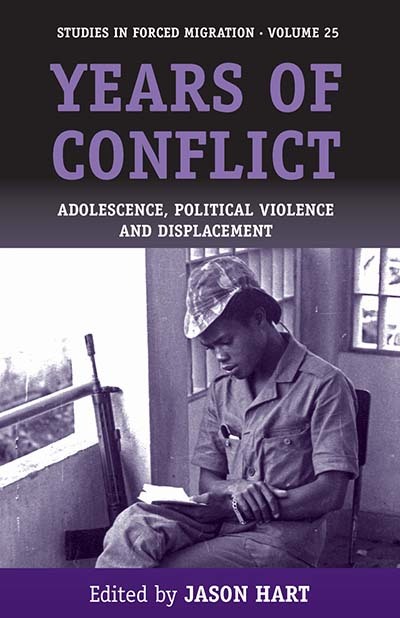 This book will be invaluable to those seeking a fuller understanding of conflict and displacement and its effects upon adolescents. It will also be welcomed by practitioners concerned to develop more effective ways of providing support to this group. Jason Hart is a Senior Research Officer at the Refugee Studies Centre, University of Oxford.